Hakoom, one of the more prolific and visible trophy hunters in the PlayStation Network, just broke through to level 100—a rank that requires a user to win some 30,000 trophies. Three others have also breached the 99 barrier, thought to be the limit when PSN instituted trophy support back in mid-2008. Hakoom gets the publicity mostly because he runs a "trophy service" in which he helps folks win hard-to-win trophies—i.e. by playing the game for them—in exchange for money or PSN cards. Naturally, that opens him to accusations everything he does is a sham and he's cheating somehow (the common allegation, which Hakoom steadfastly denies, is that multiple gamers are playing on his account.) In the e-peen demimonde of achievement/trophy hunting, where everyone better than you is a liar or has no life, and everyone worse than you is an idiot noob, this is all par for the course. There are three other 100-level PSNers out there, also accused of being "cheaters" by one of the third-party trophy sites monitoring gamers' progress. Hakoom says he was banned by the same site over a personal grudge. So who knows what the agenda really is there. (Indeed, this site currently lists 46 players at level 100). 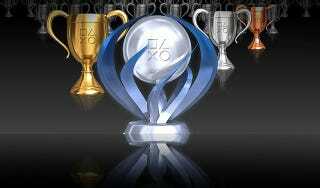 But at least four accounts have level 100 status officially conferred by PSN. That's not in dispute: Go to the PlayStation Network's official site and search for the IDs Hakoom, warfigher [sic], DevilsProduct666 and nub_1983; all are level 100. This is a hell of a large accomplishment, considering how each level's XP requirement increases progressively. As Hakoom pointed out on Twitter, 180 points are given for a platinum trophy (won by earning all trophies offered by a game), 90 for each gold trophy, 30 for a silver and 15 for a bronze. It takes 880,000 points to get to level 100. Hakoom says it took 1,900 days—more than five years—for him to pull this off. That's a lot of gaming.